We're just about a week out from the rumored launch of RadioShack's Cricket-based No Contract Wireless plans, and more details are beginning to trickle out about the prepaid service. Specifically, we've just received information concerning how much The Shack intends to charge on a monthly basis, and it's just about what you'd expect: you can choose between featurephone and smartphone options, with the former hooking you up with unlimited messaging and your choice of 300 minutes for $25 or 1,000 minutes for $35. As for the smartphone plans, you'll get unlimited voice, messaging and Muve Music downloads on both selections; the $50 option will get you one gigabyte of 3G data (before throttling ensues), while $60 bestows you with 2.5GB data and mobile hotspot use, Visual Voicemail access, unlimited international text and all-you-can-eat directory assistance. As a comparison, Cricket's $35 featurephone plan will give you unlimited voice and SMS, compared to 1,000 minutes and unlimited SMS / MMS / 1X data on The Shack. The carrier's basic smartphone option is $55 and offers unlimited voice, messaging and 3G data (throttled at 2.5GB); this may seem like the better deal -- unless you're interested in using Muve Music. Since you have to pay an extra $10 to add the unlimited music service into the mix on Cricket, you'll see a monthly savings of $5 if you waltz into The Shack for the top-tiered plan. We're still waiting for RadioShack to come clean and acknowledge the existence of the NoContract service, but we'll continue to reveal more details as they come down the pipeline. 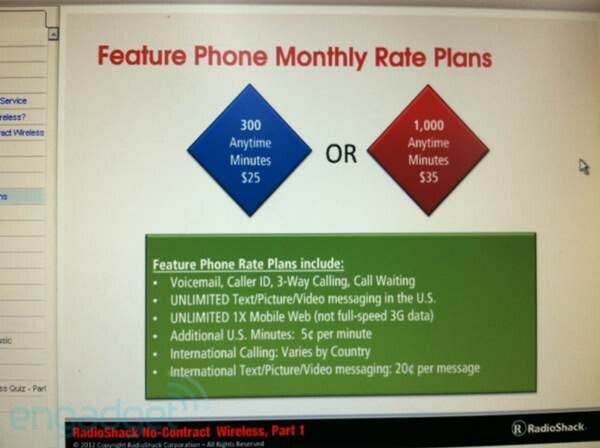 Check out the featurephone rate plans after the break.